There is nothing more satisfying than the smell of freshly baked bread. If you’ve always fancied yourself a bit of a Mary Berry but don’t have the time or patience to make homemade bread from scratch, then you’ll want to invest in one of the best bread makers 2017 has to offer. If a freshly baked loaf is a family dinner staple, then investing in a good bread maker could save you time and money in the long run. The average cost for the best bread makers is around £100, but you can find cheaper ones that do an equally good job for those on a budget — or, if you're lucky, a Black Friday bargain. Whether you want to bake a big loaf to feed all the family or simply want enough to share between two; most bread makers can make different sized loaves and can be baked to suit different tastes. Some people prefer wholemeal over white, and some prefer their loaves light and fluffy rather than dense with a hard crust. Whatever your preference, there is a bread maker that can make your perfect loaf. If you want the luxury of home baking without the hassle, then look out for bread makers with rapid bake settings and ones that can keep your loaf warm until it’s time to eat. You can also find bread makers to bake your bread at a specified time, so it’ll be fresh and ready to be eaten with a warming bowl of soup when you get home from work, or toasted to perfection when you wake up in the morning. For those with dietary requirements or preferences, many bread makers today come with gluten-free and wheat-free settings so that everyone can enjoy the taste of freshly baked bread. Some bread makers also have the ability to double as pasta, pizza, jam or cake makers, and come with a range of accessories such as kneading tools and recipe books for first time bakers. This bread maker has a slick stainless steel finish that would look great on any kitchen countertop and includes a comprehensive package of accessories. Although pricey, when you invest in this bread maker you’ll get the full works including a bread tin, kneading blades, measuring cups and a recipe book; making it a great choice for beginners and more advanced bakers. You’ll also have a number of different baking options with a staggering 27 different cooking modes, including rapid bake and a 13-hour delay timer so you can always have freshly baked bread prepared no matter where you are. The Kenwood Bread Maker in white is a great investment for those who aren’t as familiar in the kitchen as others. The intuitive interface has 11 cooking modes and allows you to bake a homemade loaf in as little as 85 minutes. Not only does it make regular bread, but you can experiment with making gluten free options, pizza bases and even jams and marmalades with the included recipe book. This is one of the best bread makers for learning how to bake with excellent results every time. Make tasty fresh bread every day for all the family with the Lakeland Daily Loaf Bread Maker. This gadget fits perfectly on your kitchen countertop without taking up too much room and has 11 settings for you to choose from when making the perfect loaf. Whether you want your fresh bread for breakfast or for dinner, this bread maker can be set to bake your bread as and when you want it with a delayed start feature that will ensure you have a warm bake ready and waiting for you when you need it most. If you’re a perfectionist, then the Cuisinart Automatic Bread Maker will ensure you get the perfect bake each and every time. Whatever type of bread you wish to make, simply add your ingredients and choose from one of the 12 cooking modes then let the machine work its magic. 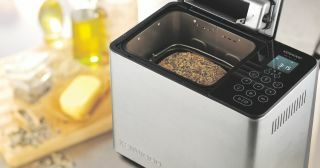 You’ll never have to worry about your loaf going to waste when this bread maker has a 1-hour keep warm function so that you can serve your loaf when ready, and it also has a 10 minute power back-up system so that you don’t waste a bake in the event of a power cut. If you’re looking to experiment with baking bread for the first time, then this Cookworks Bread Maker is an affordable option to get you started and is one of the best bread makers for students. With 12 cooking modes, keep-warm function, delayed timer and a viewing window, you have a wide range of options that are bound to make you want to bake every day. You can also use this bread maker for jam and cakes and use the quick bake setting if you’re short on time. Homemade bread has never been so easy with the quickest bread maker on our list, the Morphy Richards Fastbake Bread Maker. If you love the idea of home baking but don’t have the time, then this gadget will allow you to enjoy fresh bread without the hassle. You’ll also get a handy recipe book to help speed up the process and the delayed timer means you can go about your day and come home to a beautifully baked loaf ready to enjoy. For those who like everything in its place, the Russell Hobbs Compact Bread Maker is an ideal addition to you kitchen that won’t take over your worktops. This little gadget isn’t lacking in function either. You can choose from a whole range of options including standard loaves, French bread, gluten free, cakes, pizza dough, jams and much more. You’ll also have complete crust control to create the perfect finish to all types of bread. This is a great little investment for the experimental baker. The Kenwood Rapidbake Bread Maker is the ideal companion for creating personalised loaves and is one of the best bread makers for quick baking. You can save your preferences as settings for quick and easy baking whenever you want. It has a contemporary design and viewing window with light so you can keep an eye on the progress of your loaf. The touch screen settings and clear LCD screen also make this bread maker extremely quick and easy to use and you can set your bake for up to 15 hours ahead for those who are super organised.